Heat oven to 400°F. Spray 15x10x1-inch baking pan with nonstick cooking spray. 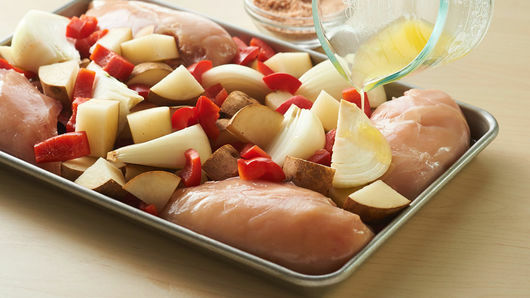 Place chicken breasts on pan. Place potatoes, bell pepper and onion on pan with chicken. Pour melted margarine over chicken and vegetables. In small bowl, combine cheese, garlic powder and paprika; sprinkle over chicken and vegetables. Bake at 400°F. for 30 to 35 minutes or until chicken is fork tender and juices run clear, stirring vegetables once halfway through cooking. Russet and Idaho baking potatoes, both mealy-textured, are preferred for baking. Waxy-textured potatoes, such as red-skinned and Yukon gold varieties, have a firmer consistency that's better for boiling and salads. Use cubed zucchini or yellow summer squash, or both, in place of the bell pepper. Sprinkle each serving with minced fresh parsley and chives. Serve with tomato and lettuce salad and whole-grain rolls. 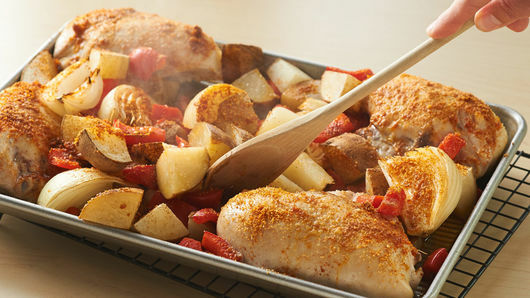 Nothing says a hardy, well-balanced dinner quite like baked chicken and potatoes. This recipe is a go-to favorite for anyone who wants a low-key, but delicious dinner for the whole family. To round out this entrée, serve with a green salad and rolls on the side. We suggest using medium russet or Idaho baking potatoes for this recipe. Idaho potatoes are fat-free, cholesterol-free and a good source of vitamin B6 and dietary fiber. Specifically, russet and Idaho potatoes have a great texture for baking and will give you the best results after just 30 minutes in an oven. (Speaking of potatoes, did you know that the average American eats about 124 pounds of potatoes are year? That’s a lot of meals.) Ever wonder how to tell if your chicken is done? We’ve compiled a guide full of tips and tricks for how to cook a whole chicken that will tell you exactly what you need to know. 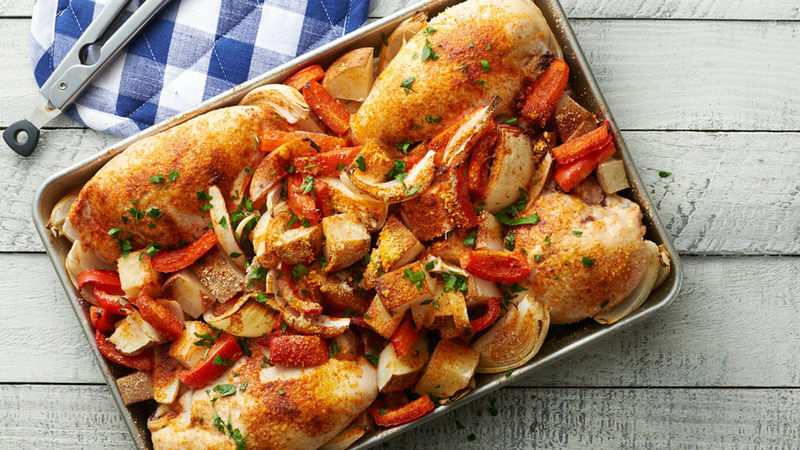 Feel ready to take on more delicious chicken recipes? Browse all of our best chicken dinners and appetizers.